A program to save South Asia’s wild vultures from extinction by breeding captive populations may be an exercise in futility, according to research released today. Vultures once numbered tens of millions in India, Nepal, and Pakistan, where they provided valuable health services by consuming the remains of animal carcasses quickly. The birds also disposed of human remains set out for them on sacrificial “towers of silence” by adherents of the ancient Parsi religion. When numbers of the bird crashed to a few thousand across the entire subcontinent the impact was dramatic. Rotting carcasses stunk up the countryside, incubating disease. Populations of feral dogs scavenging on the meat bonanza exploded, and the dogs also spread diseases, including rabies. Parsis, whose religion prohibits burying or burning their dead, had to resort to technology such as solar reflectors to hasten decomposition of corpses. 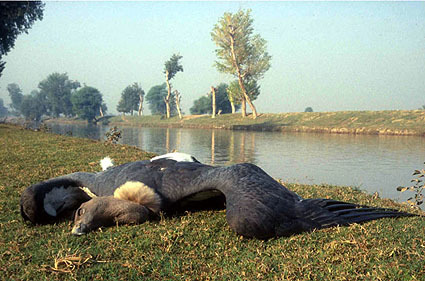 The fate of South Asia’s vultures is a tragic story. When their numbers began to plummet in the mid-1990s researchers were mystified. By the time the cause was identified–widespread use of diclofenac, a non-steroidal anti-inflammatory drug that had become a popular treatment for ailing livestock–several vulture species were on the brink of extirpation.